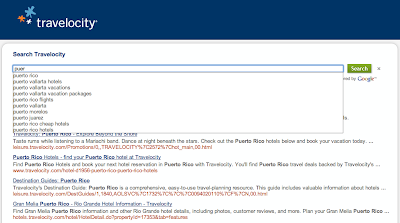 that you can now enable query autocompletions for your search engine. 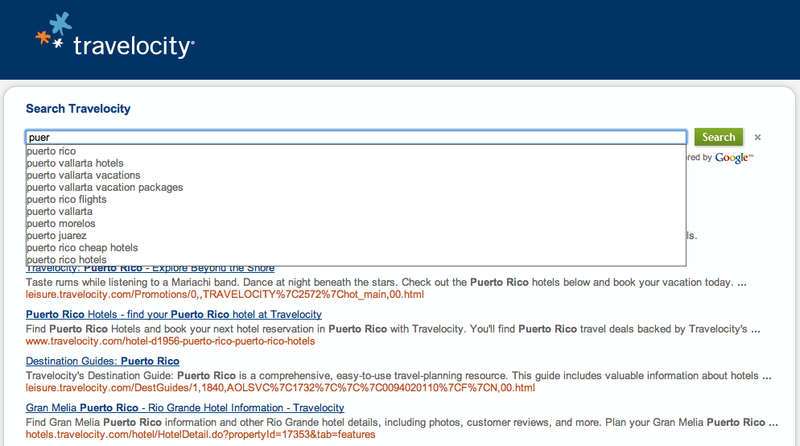 The screenshot below shows an example of query autocompletion at Travelocity. Custom Search autocompletion is similar to what you see on Google.com—optional queries appear as you type your query in the search box. However, behind the scenes, we do a lot of things differently. We created a different algorithm that uses data from multiple sources, including queries to your search engine, as well as keywords and phrases extracted automatically from the content of websites that your search engine covers. Because the autocompleted queries are based, in part, on the specific content of the webpages covered by your search engine, we will not generate autocompletions for custom search engines that search the entire web, i.e., autocompletions will only work if you set your preferences to Search only included sites in the control panel. To enable autocompletions, select Enable autocompletions in the Basics tab of the control panel. After you’ve saved your settings, replace the code for the search box in your website with the search box code from the Get code tab and you're done. Please note that it can take a few hours for us to start generating autocompletion queries for your search engine. If you are using the Custom Search Element with a theme, the autocompletions are styled to match the look and feel of your theme. Autocompletions will also work on high-end mobile devices. We hope that you find the feature useful. As always, give us feedback so we can improve the feature. One of the most requested features for Custom Search is autocompletion of queries. Today, we announced at Google I/O that you can now enable query autocompletions for your search engine.